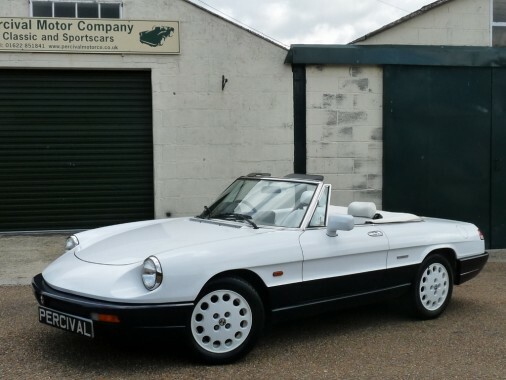 We are very pleased to offer this immaculate Spider, a rare French special editon called a Beaute. It features white upper bodywork with dark blue flanks and bumpers contrasting with the white alloy wheels and a blue fabric hood. Inside there are white leather seats with dark blue carpet. This car came to the UK in 1994 and was converted to Right Hand Drive. It has only covered 56,000 kms (approx 35,000 miles) and has a complete service history back to new backed up by MOTs and the original Alfa Romeo Dealer pack with a service book and all the handbooks. It is in superb, rust free condition throughout and has been cared for by its last owner of eighteen years. As with all S4 Spiders it has a 2.0 litre, twin cam engine with a five speed gearbox, power steering, fuel injection, enabling it to run on unleaded petrol, a radio cassette player and electric windows and mirrors. So you get a classic sports car but one that can be driven easily. This is the second S4 Spider that we've had recently, both with low mileage and long term ownership. They really are wonderful cars to own.